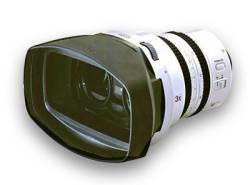 Canon has boldly claimed a stake on immersive digital video territory with the introduction of a first-of-its-kind 3D zoom lens for its popular XL1 digital video camera. By introducing stereo imaging into the digital producer's toolkit, this new lens could add depth, literally, to all kinds of projects from documentaries, to medical applications and interactive game footage. In the past, stereo photography has often discouraged experimentation because of its many quirks and limitations. Fortunately, Canon's thoughtful design gracefully dodges the usual quirks with clever engineering. First, it employs a high-speed shutter to alternate between capturing left and right images 30 times per second. Such a "Field Sequential System" offers the huge advantage that both images ultimately pass through the same zoom and focus optics. This means that the image pairs always remain aligned and identically focused, something that takes constant manual recalibration for twin lens stereo systems. Secondly, a smart focusing unit in the 3D lens constantly adjusts the angle of convergence (i.e. makes sure both images are looking at the same point in space) even as you zoom in on different subjects at different distances. Less sophisticated lens systems commonly require manual re-convergence between fixed shot setups. Otherwise, a simple zoom-in would give the entire audience a wall-eyed, parallax-induced headache. If these innovative design choices are any indication, Canon's 3D lens could be just the thing to draw audiences deeper into your digital video subjects while making stereo photography less a leap for you into the artistic unknown. Copyright © 2006 Stephen Jones All rights reserved.